The instrument is currently unavailable until I can resolve hosting issues. The above download will patch the version that was available prior to the 11th of September. The prior version had a looping error in bottom D of the Bourdon. 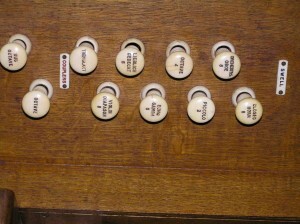 The combination switches are also now visible in the “Connect switch (MIDI) inputs to organ inputs…” dialog box. This is my second Hauptwerk sample set. More care has been taken in the recordings, and even more care was taken with the noise reduction in an attempt to bring you an instrument as close to the original as possible. 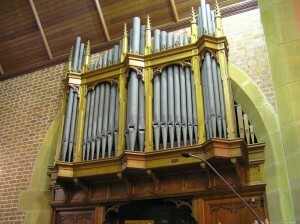 Front view of the organ containing great Open Diapason and Dulciana pipes. 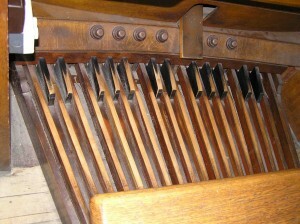 View of the organ from the pews, showing the pedal Violon-Cello side case. The organ of St. Augustine’s Anglican Church, Neutral Bay was built by Hill, Norman and Beard in 1929 to a specification drawn up by George Faunce Allman. It’s been built into a wonderfully detailed neo-Gothic case. # The Closed Horn is harmonic from middle C up. Replacing the Suabe Flute 4′ with a Fifteenth. Replacing the Voix Celeste 8′ with most of the Suabe Flute flute transposed to form the Piccolo. Recovering the leather motors of the triple-stage exhaust pneumatic action. The cleaning of the organ. 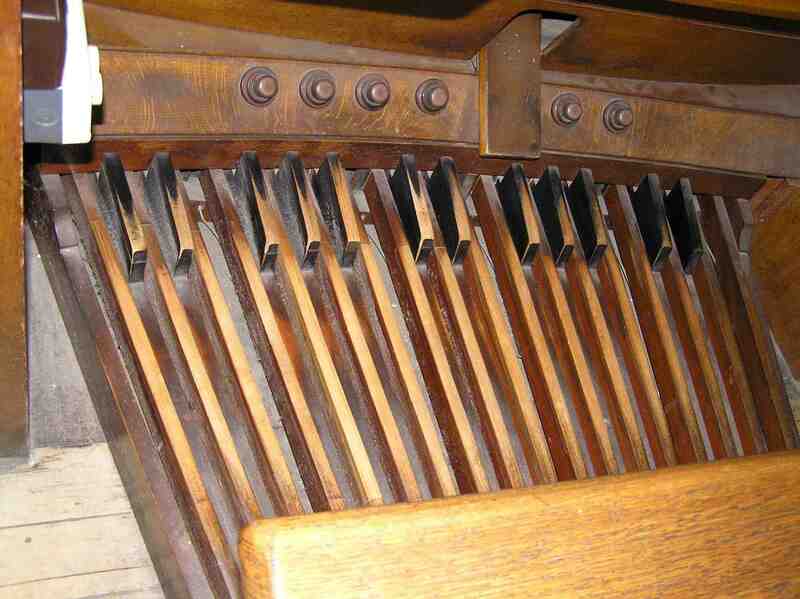 The organ’s soundboards, bellows and console all remain original. 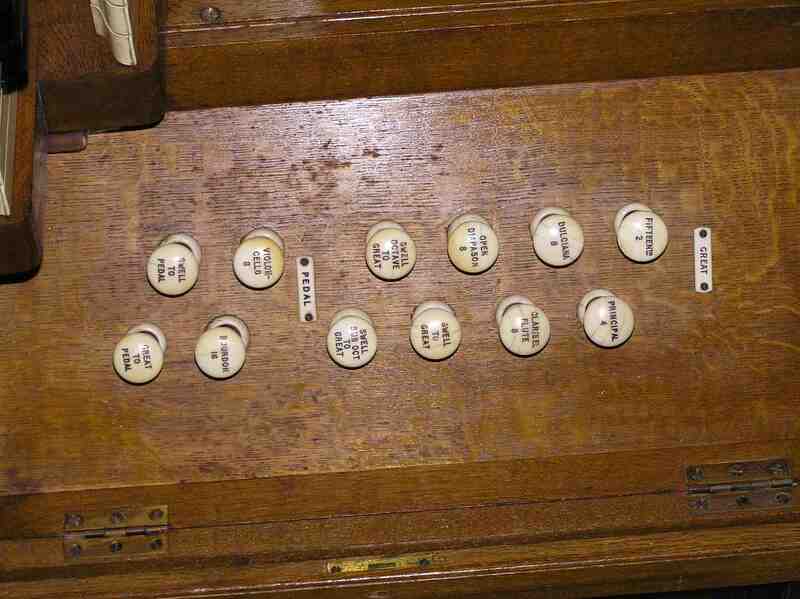 Worth noting is the 73 note swell chest, which has all current ranks provided with an additional octave of notes except for the Piccolo. 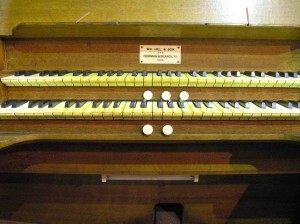 The action of the organ and all of the coupling is tubular-pneumatic (except for the Swell to Pedal and Great to Pedal which are mechanical). The organ’s compass is 61/30 and the swell is controlled by a balanced swell pedal. 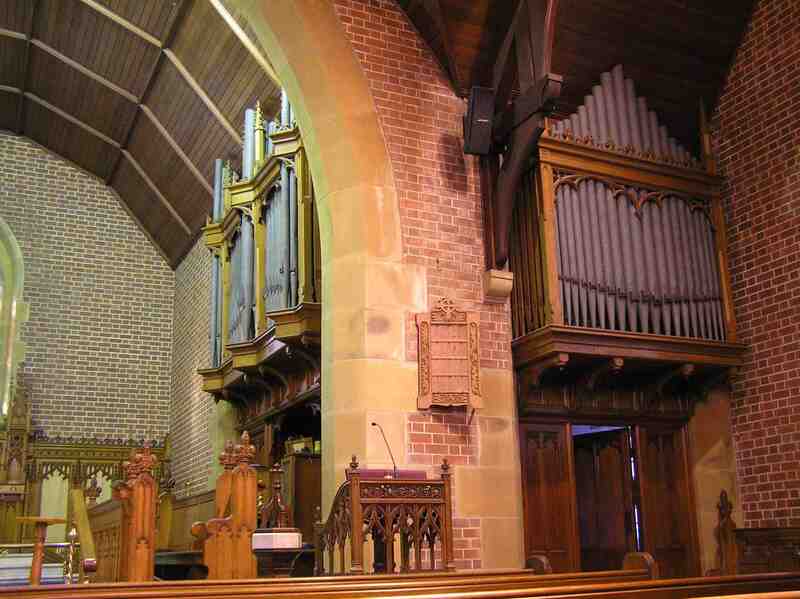 In 1996, the bellows were releathered by Peter Jewkes Pipe Organ Builders Pty Ltd.
View of the swell stops. View of the great and pedal stops. Pedalboard details and balanced swell pedal. 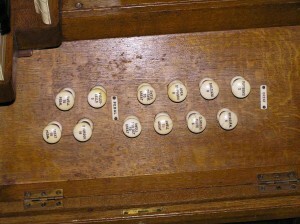 View of the key-profiles and nameplate. 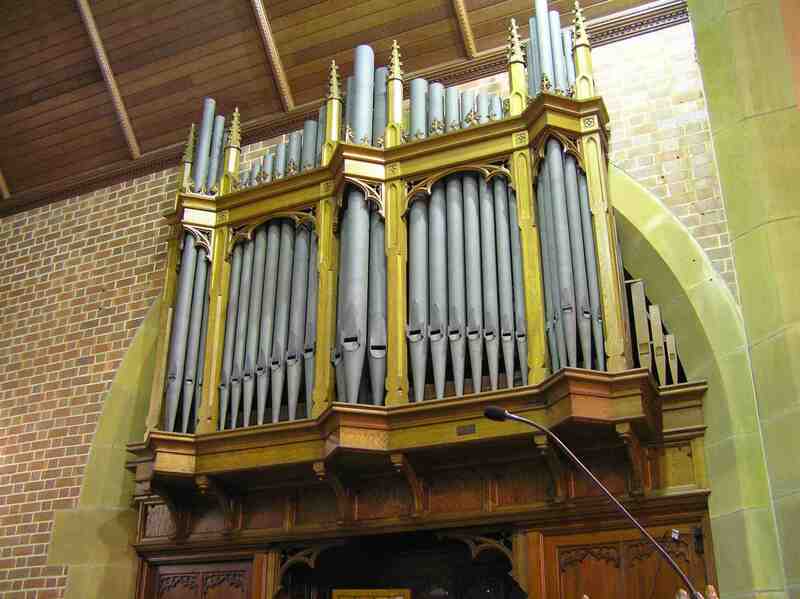 The St Augustine organ is not available on the Hauptwerk website. 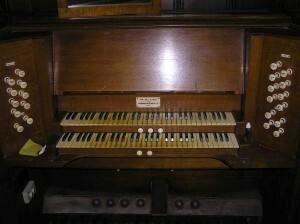 Thanks for this organ. I converted it to Kontakt. I gave you credit for the samples in the instrument itself under infos, on my blog and in any information releases. I also included the info text with the instrument. I hope this meets your approval. Thanks for letting me know you have used the samples. Yes, your use is absolutely fine. 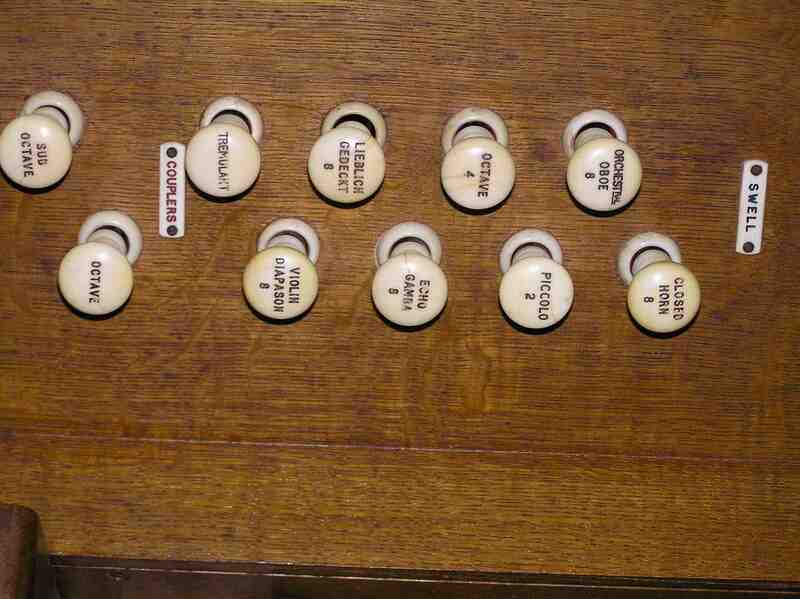 I have changed computers and want to reinstall the St. Augustine’s organ. I have downloaded the v1.01 from v.100 comppkg.Hauptwerk.rar, but it won’t install. HW gives me an error message that it requires ID 000720. Can you advise please? The v1.01 from v1.00 download is a patch which fixes a broken note in the v1.00 download. The error message is likely due to not having v1.00 installed. At the moment, I do not have hosting available for the download, but hope to have this rectified soon.